I bought this monitor around six months ago. 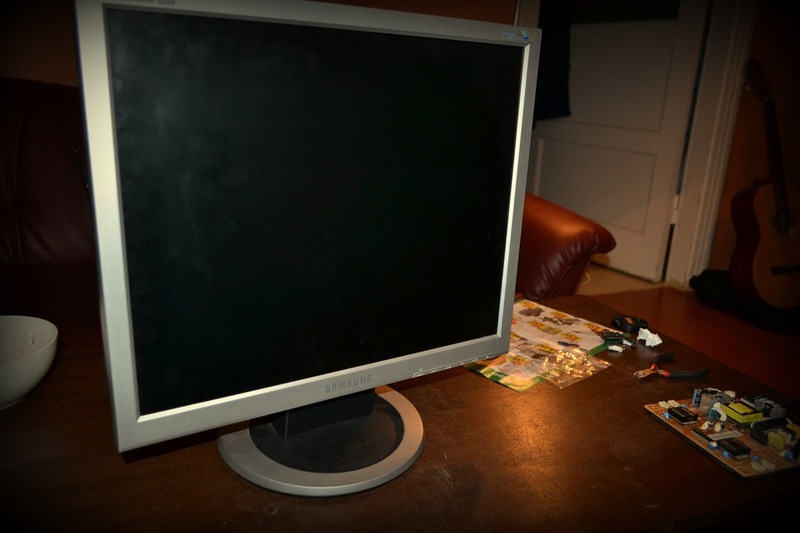 It was slightly used, with even some scratches on the screen but as I used this monitor as second one it doesnt bother me very much. 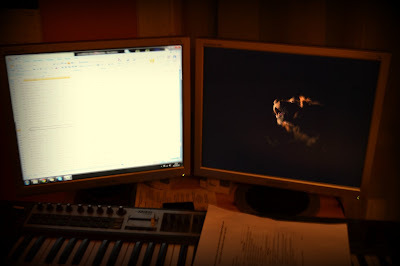 This morning I woke up, switched on both monitors and this one didnt want to light up. That means - Its power light responded and computer recognized it but no backlight working. Four screws for stand, two more in both lower corners. I knew exactly what happened with it because I had exactly the same issue with the primary monitor which is same brand and model. There are two bad capacitors on that board which were gone boom. I decided to change them by myself. 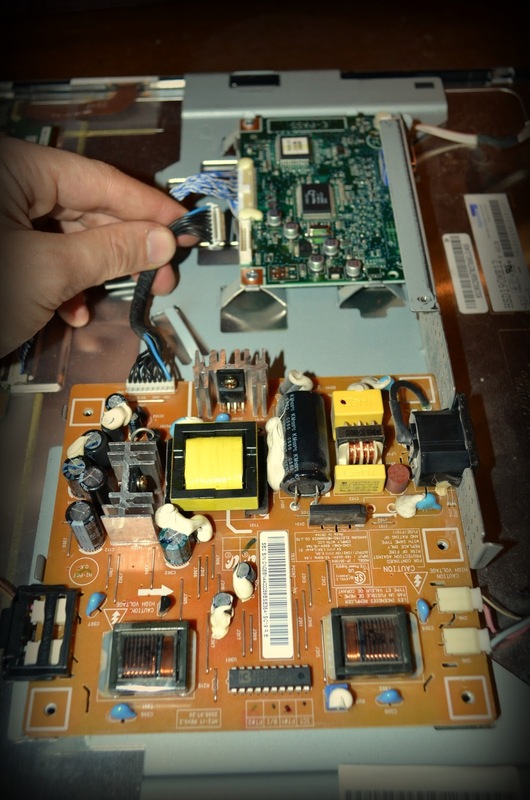 Previously in the primary monitor there were both capacitors and one MOSFET fried. That time I changed whole power board because of this fried MOSFET. First assumptions were that only these two capacitors were bad so I decided to change only them. 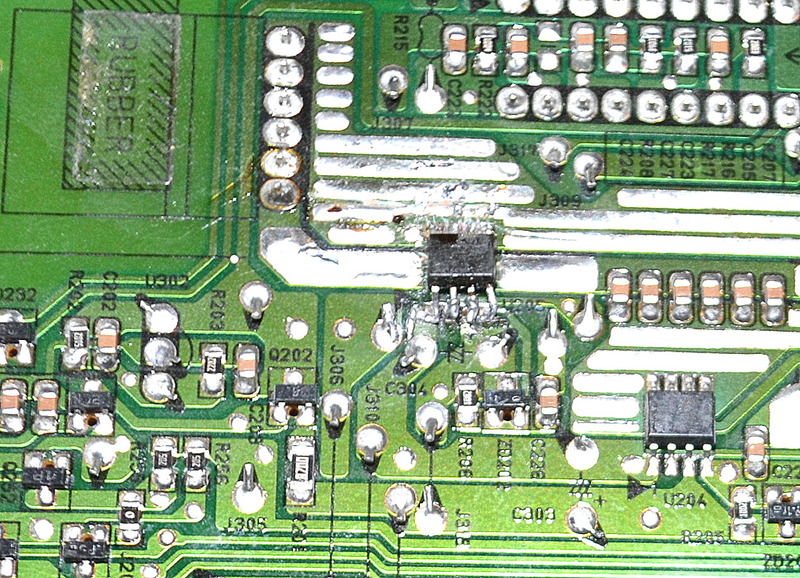 But after changing them the monitor still didnt work and I saw that MOSFET frying with smoke. That observation killed all my hopes for repairing that circuit board by myself. 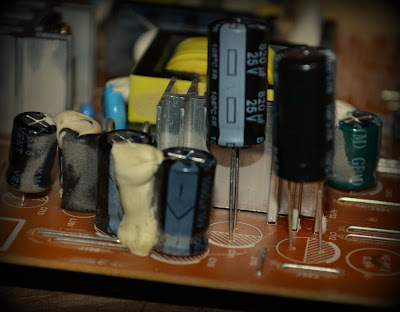 Firstly I didnt have such MOSFET available and secondly, if I would have it, I wouldnt be able to solder it because not having proper instruments. Somehow I noticed that on this power board there are two identical MOSFETs. 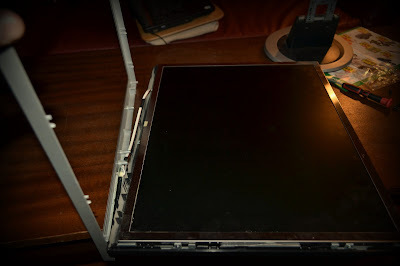 As I had saved this old power board from first monitor repairs, I thought - I could loose nothing if I would try to desolder off the one which wasnt fried from that old power board and change with that fried chip on the original power board of this second monitor. Well.. doing it carefully as much as I could, I got that monitor working again! So, I have skill up in soldering small things :D Here are some insights of how this monitor looks from inside. Front panel. The second thing to do after removing six screws is to remove this grey front panel from it. 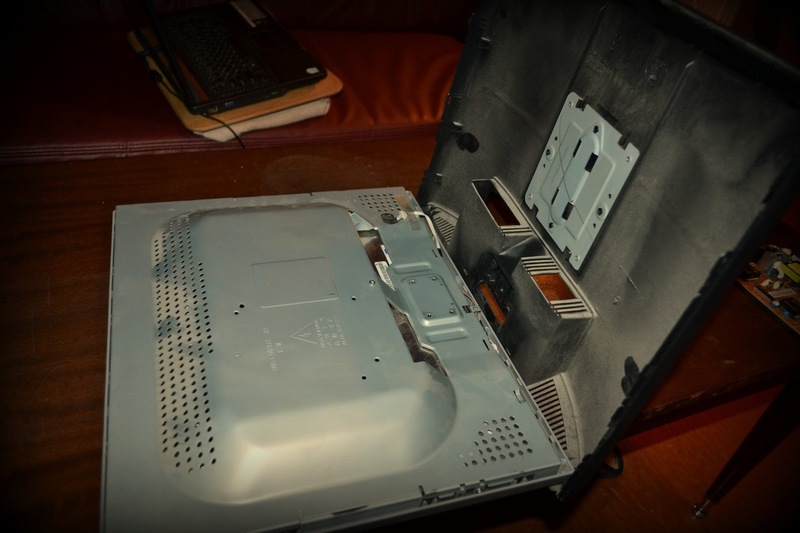 And only the it will be possible to take off back cover and unscrew that metal shield. 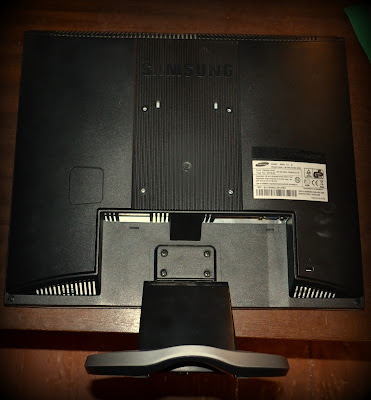 One screw in the center, four more on both sides, together five screws. Above that shield there are three boards. 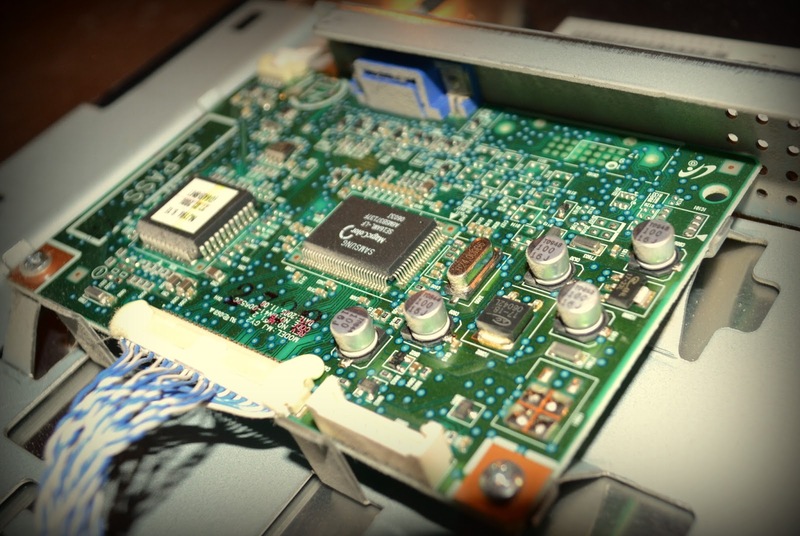 I am interested in power board- this brownish one. Disconnecting it from main circuit board just unattaching that broad cable. 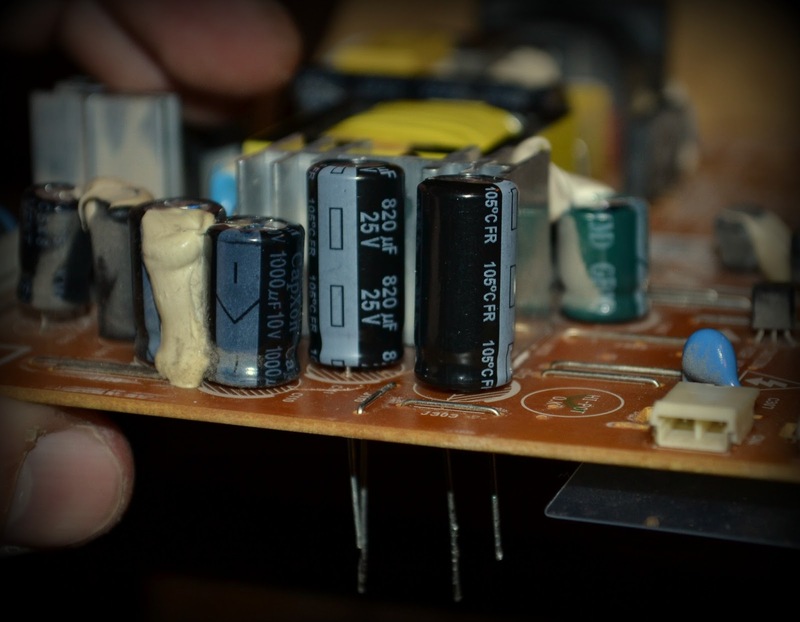 So here are these two brownish capacitors with top part blown up. Removed them and put new 820 uF 25V caps in these places. As they are electrolytic caps, it depends how they are placed. Shorter leg where stripes are. Power board from behind. So, where are that chip exactly? 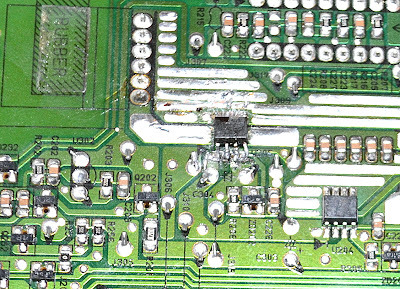 Close-up of that bad chip. 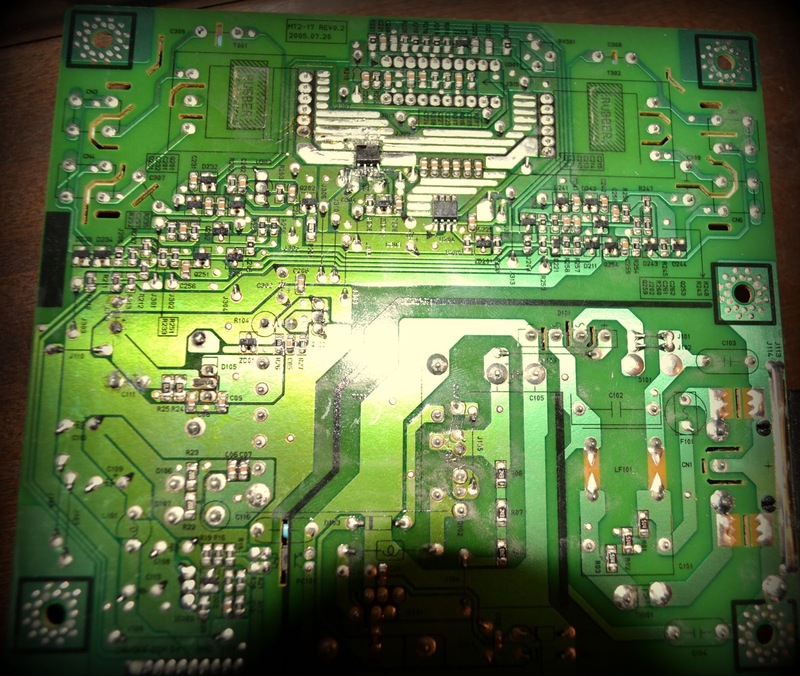 Here in this picture it is resoldered one. 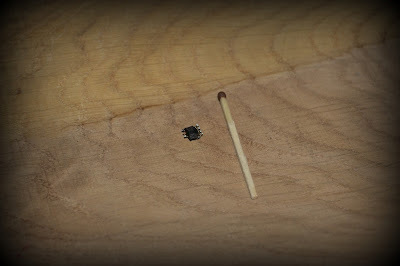 Since I am terrible at soldering and stuff which is smaller than my fingernails... it was not supposed to work... But after testing legs with multimeter and getting different readings it seemed that nothing is shorting out and I gave a try. Miraculously it worked fine. Notice, that "upper" legs all are connected to negative rail. 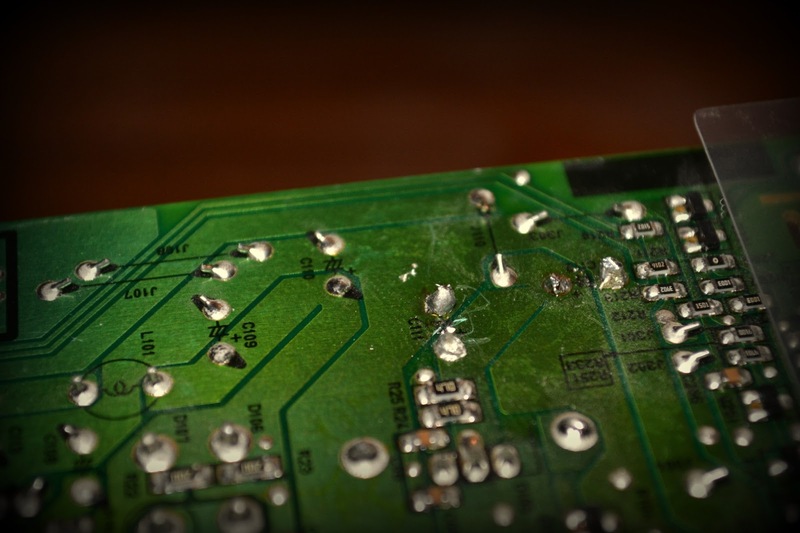 So that meant they could all be soldered altogether. Comparing the size of MOSFET and match. 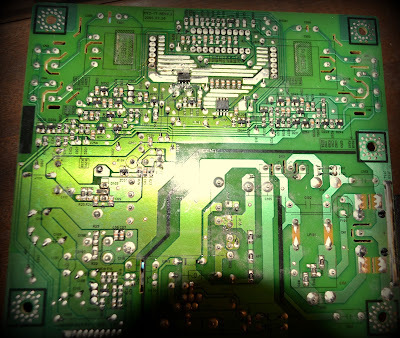 Additional picture about how the main circuit board looks like. Here we go. Both monitors working fine. The repaired one is in the right. working project is very nice. This is a nice post. Nice job you have done. Science has made our life easy and comfortable. Thank you for your nice sharing.